What about you, yay or nay? Would you rock the heart-shaped eyewear? Sono troppo simpatici questi occhiali a forma di cuore! Che belli, ne ho presi anch'io un paio! 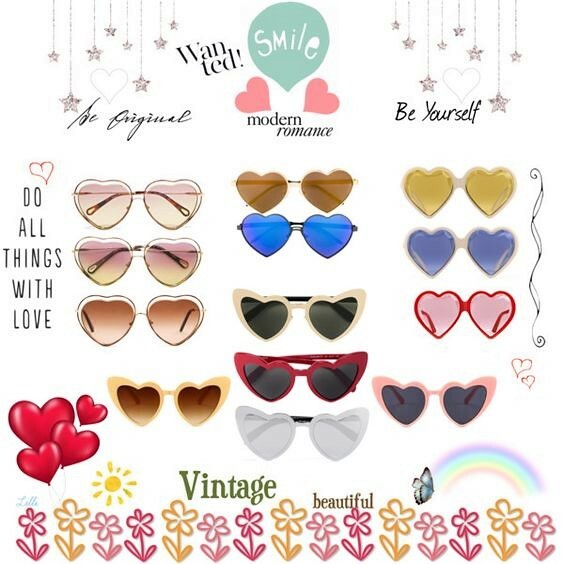 The heart shape eye glasses are fun and cute to wear. The colours here are lovely. You're right Lilli! Heart shaped sunglasses are so trendy and fun and now I want a pair. I'm loving the ones with the metal frames and graduated lenses. Happy new week babe! I am a definite yes to these! I adore heart shaped glasses! I can't wait to see yours! Io sono una patita dei cuori... anche la casa l'ho riempita di oggetti con questa forma così romantica e delicata. Avevo anche degli occhiali rosa a forma di cuore ma... non li trovo più! Dovrò ricomprarli. I've always wanted a pair of these! I think I spent so many years coveting a pair by Wildfox. Can't remember if I brought them or brought something similar. Or maybe, none at all. I definitely still want a pair and would love to see you rock some too Lilli.